Glanert studied with Hans Werner Henze, a prodigious and controversial composer of opera, ballet, and other works who studied and worked in 12-tone and serial music early but also in jazz, popular, and neoclassical styles. Glanert’s own style has moved on from early serial atonality to something carefully described in online sources as “balancing between Mahler and Ravel” – but I am not convinced. Less popular than those two luminaries, Alban Berg’s Lulu is far more obvious as a jumping off place to get to Caligula, which reflects Glanert’s maturing voice as a composer. Like Berg and Henze, Glanert relishes jazz stylings and has extended that impulse in this work to also include Afro-Caribbean rhythms, plus enhanced breathing as a musical effect that made me think of beat-boxing. All this is fascinating to me because I also took a turn in 12-tone tonality during and after my own studies, working in the tradition of Alban Berg as promulgated by George Perle. Even though I left the “school” it was a marvelous thing to hear and see how the practice has not only survived, but enjoys an audience. The house was not packed, but neither was it empty. Although a piano is heard in the video above, the orchestration is lush and the conductor and musicians knew what they were about. The score was beautifully played. Some critics panned the show, both in terms of music and theatre (here is one from The Arts Desk). Techniques used in the staging would have been considered avant garde 30 years ago, but today they seemed reliable and suitable to a serious work like this. Neither Mary nor I got offended that they had borrowed New Wave chestnuts like a static public setting — in this case stadium seating (see pic below) and unexplained figures in slow motion perambulation, either naked, with mysterious masks, or costumes apparently unrelated to the scene. The mix of symbolic and random images combined as intended to get the audience into a semiotic stupor trying to sort intentional from unintentional ideas. 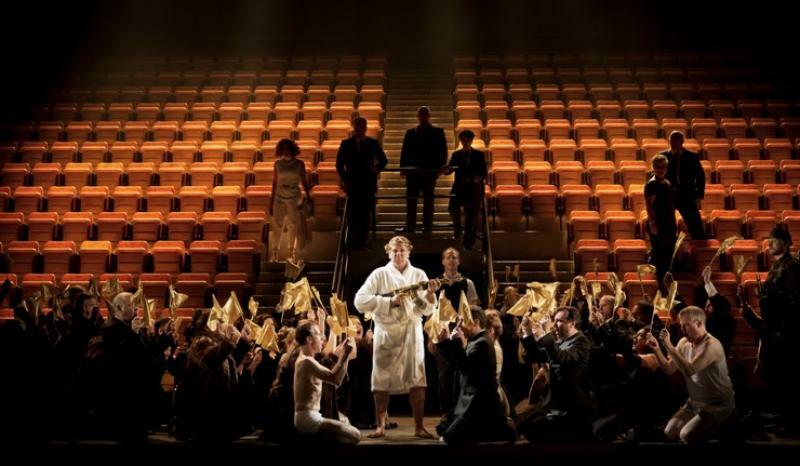 Groups like Byrd Hoffman School of Byrds and The Wooster Group introduced these techniques but why should we be surprised to see them appearing now as tried and true techniques for big opera productions? That’s how it’s supposed to go. We enjoyed it.